Joseph Mallozzi's Weblog: June 24, 2009: August’s Book of the Month Club Selection. And – BEST. MOVIE REVIEW. EVER! June 24, 2009: August’s Book of the Month Club Selection. And – BEST. MOVIE REVIEW. EVER! As a rule, I tend to steer clear of books I’ve already read but this is one of my absolute favorites, a beautifully written, enormously touching, altogether tremendous story that you don‘t have to be a fan of science fiction to enjoy. Allow me to reiterate and underscore: Even if you generally don’t read science fiction, do yourself a favor and pick up this book. Like I said, I don’t usually choose novels I’ve already read but, in this case, tradition is trumped by a desire to introduce as many new readers as possible to this exceptional work. 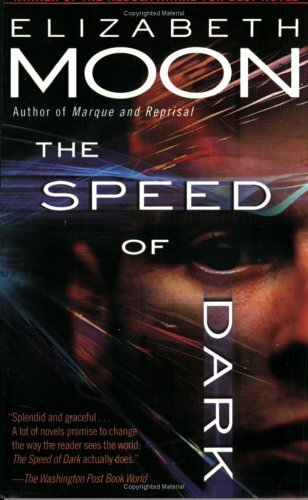 Discussion on The Speed of Dark will begin Monday, August 3rd and we’ll be joined by author Elizabeth Moon. Hey, you know who’s great? My buddy Carl. Not only is he a terrific sounding board for story ideas and run-throughs of prospective jewel heists, but he’s incisive, humorous and guaranteed to go off on at least one hugely entertaining rant a day. Oh, and he’s also very informative, a wealth of reality show trivia and topical web links. And so today, I present a couple of items from the Need to Know file, compliments of Mr. Binder…. The first is The Greatest Movie Review Ever! Roger Ebert’s take on the latest Michael Bay two and half hour oeuvre, Transformers: Revenge of the Fallen. His review begins: “ “Transformers: Revenge of the Fallen” is a horrible experience of unbearable length, briefly punctuated by three or four amusing moments.” – and then he really lets loose. http://rogerebert.suntimes.com/apps/pbcs.dll/article?AID=/20090623/REVIEWS/906239997 Brilliant! The second is list of The 13 Most Unintentionally Disturbing Children’s Toys, put together by the fine folks at Cracked.com: http://www.cracked.com/article_17493_13-most-unintentionally-disturbing-childrens-toys.html. I got to get me one of them remote controlled yodeling lederhosen. Previous Article June 23, 2009: A Cracking Spot of Thee-Atah! Next Article June 25, 2009: The Doctor Is In! Actor Paul McGillion Answers Your Questions. Do you not usually re-read books? I’m one of those people who will read a beloved book over and over (and over).. It usually drives my dad crazy ’cause he can’t figure out why you’d want to read (or watch) something over again. Have you been following the situation in Iran? It seems to get worse everyday…. Right. I am absolutely sure of it this time. You are conspiring against me and all of the people on this thread whose questions you never answer. We patiently post questions right after you have answered a bunch of other questions, certain, that this time will be the one in a million (or is that 14 million) chance that you will answer our questions. Yes, Joe, we know about you. Like Canada’s lottery regulars, we return almost daily to offer a question that will pique your interest in the hope you will answer it. But you never do. Again and again we are thwarted. Well, enough is enough. Next time I return, I am going to buy so many tickets, er, I mean, I am going to ask so many questions that you will have to answer at least one. So there, smarty. The game’s afoot, as Sherlock Holmes would say. I urge all my fellow ignorees to follow my lead and post a minimum of one question. Then Joe will regret messing with us. Holy Crud. BotM club time again? Time to figure out where I put Blood of Ambrose and get busy….I’ve been reading several books more or less simultaniously, grabbing whichever novel has been handiest. And love that Elizabeth Moon has had a work selected. The links were also amusing, with the singing lederhosen and the evisceration Ernie dolls creeping me out the most. Just what I need to see before attempting to head to bed. Thanks for the heads up on the next book selection. Sorry I’ve been a little absent of late from the BOTM. Not that I add anything of value! I’ve been reading the Tales of the Otori series by Lian Hearn. It came recommended to me by a friend and after Googling discovered that it’s a pseudonym for my favourite childhood author, Gillian Rubenstein. I still have her books Space Demons and Skymaze in pristine condition on my shelf in my office. How did I not recognise before finding your blog that I loved Sci Fi/Fantasy? Oh, and each time I read Otori in this series of books, my brain defaults to Ori. Bloody Stargate. Okay, this did it for me: “Lou and his coworkers are autistic.” My son is nonverbal but autistic. So this book has peaked my interest. I will try my very, very best to read it. I go to my ladies book club on Sunday this week once again not being able to get the book read. I’m surprised after 2 years (or maybe more) they haven’t kicked me out. I think they feel sorry for me because they know it is the few times I get out of the house away from my son for fun, a break I desperately need. Let’s see how well people with autism are displayed within the book. Most are stereotypes, like Rain Man. Thank you again, Mr. Mallozzi, for letting my hijack your blog in an attempt to get support for Lou Diamond Phillips. In case you haven’t heard, he won for his charity. Man, Ebert did NOT like that movie! Can I get a Blippy in an Amazing Flying Monkey? I didn’t want that last comment to happen. I’m sorry. I understand that Roger Ebert has the right to his own opinion, but after I see Transformers on Friday, I’m going to have a few words to say to him. If someone is going to review anything – movie, book, whatever – the least he can do is get facts straight. As a huge fan of the first movie (and I grew up with the toys with my brother) I was bothered right away that Ebert kept saying Deciptibots. They are NOT Decipbots, they’re DeciptiCONS. Then he goes off to talk about Sam Witwicky’s parents (who were stupid in the first movie but that is what made them funny) and he said they were the parents of Shia LeBeouf. I noticed that a few times, Ebert would mix the names of characters with the names of the actors. Even if someone who is reviewing a movies hates that movie, do us all a favor and pay attention to the facts and get stuff straight. I never go by the reviews of critics. I have my own opinions and am perfectly capable of making them. I don’t need someone to tell me what to think of a movie or a book until I watch or read it. I didn’t mean to go off on you Jow, but there is my opinion and I will let you know what I think of the movie Friday night, if I remember. I just got back from watching Transformers: Revenge Of The Fallen, and it was great. I will admit some of it didn’t flow well and there are some dull moments, even during the action sequences, but for the most part, Ebert is a f*cking retard. It was all explained crystal clear why they were going to Egypt, at points they even reiterated so much that it wore thin. Sam explained it to the Autobots, then the Decipticons figured it out, then Sam informed the US soldiers, who in turn told the Pentagon. Like I said they did throw on the brakes just to insert a couple jokes, which were funny, but had nothing to do with the storyline. But I thought they did a good job sticking with the Transformers mythology, so to speak. Although they did have to make changes to adapt it to the current generations audience. If you are familiar with Michael Bay then you know what you are getting into. Tons of explosions, slow mo, big battle sequences. It is a must see, no home theatre system will even come close to a theatrical viewing. On the topic of Roger Ebert, I think he is way past his time, he needs to walk away while he kind of has his dignity. The times change and so does society, the days of The Sound Of Music, Citizen Kane, and Casablanca are over. It’s about what the fans want, and rightfully so, since we PAY to watch movies, and don’t get PAID to degrade them. I don’t know how this guy still has a job, when all he does is bash the movie industry who write his cheques. The current generation prefer the eye candy over a deep story, and if they are willing to put up the money for it, why not? I don’t know a single person who would be willing to watch or not watch a movie because of what one single person says. And if you are about to direct me to the portion of his entry that shows the European reviews, let me direct your attention to the US reviews of “Hitchhikers Guide To The Galaxy”. I would also like to reinforce my point that pretty much anybody that disliked Transformers either, never watched the show, played with a toy, or is over the age of 50. But their kids will absolutely love it!! Just wondering, you mentioned you would pick up Battlestar Galactica a few months ago. Have you got round to that yet? I love both BSG and Stargate, I’m not picking favourites here or anything, but I would love to know what you think about BSG. Also the composer for BSG is quite incredible. Not so much in season 1, but from season 2 the soundtrack is amazing (particularly episode 12 of season 2). Still…I’m not so sure there wasn’t some truth in my subconscious misperception. Oh, and MY hubby came home tonight with the same exact information regarding Transformers – too long, too stupid. Shame…I was looking forward to it. Maybe on DVD. Obviously, he’s never watched Stargate: Atlantis. Almost 4 am, better get back to sleep! Do you ever read biographies or autobiographies? Not the ‘my mum dropped me on my head as a baby then I became a reality tv star’ kind but ones like Michael J Fox’s which are humourus/intelligent? If you were going to read an autobiography who’s would it be? i didnt read the whole review because im gonna see the movie soon, i really liked the first one so who knows. the thing that i dont get is that these people who makes these movies are obviously smart enough to understand what went wrong with the first one, so why did they repeat the same mistakes again? i find the hard part to be all the action and CGI but the story that accompanies it is easier to create. Im guessing for such big movies they dont have much time to think of something good. Elizabeth Moon = excellent writer. I’ve enjoyed many of her books. I’ll have to refresh on this one for the discussion. My memory isn’t what it used to be; maybe I can start re-reading fave books… naw. Too many new ones still unread. I heard about Ebert’s review through the Twitter grapevine. LOVED it. I must admit, Michael Bay films sit somewhat uncomfortably with me. I walked out of Armageddon after about 5 minutes and only re-watched it when it came out on DVD. Even then it involved a lot of stop-starting until the film finished. OK, I’ll cave to the August selection. That one fits my usual “can’t put it down” genre. I read a novel years ago that I am now trying to find the name of. Can you or anyone reading this help? The story is about a space faring naval fleet. The lead character is a young man who isn’t prepared to deal with problems that occur on his first tour of duty out of the academy. He firstly ends up as captain after the death, due to accident or health problems of the higher ranking officers. He then has to fend of mutiny by executing by hanging a lower ranking officer as punishment. This is all then made worse by the fact the all singing and all dancing AI computer goes nuts. Does it ring any bells. The story was one of 3 books or a trilogy. I read that book last year and it is wonderful. I’ll join the discussion, if I remember enough of it.